As a professional writer, Nova’s blog connects her to both her readers and fellow writers. She sets the tone right away, by using a custom header and custom background. Nova also uses two of Sight’s most compelling options to great effect: the featured image slider and both of the available custom menus. Nova’s chosen “Dreaming of Stardust” as her custom background, giving an ethereal look to the blog that mimics the feeling of her books’ covers. Think about how your own background and header play off of each other. Together, do they create a look that represents your personality? Next, Nova uses Sight’s image slider option, allowing her to present the content she most wants readers to encounter, in a professional, magazine-like way. This is an easy way to add movement to Sight, and is a snap to deploy. Nova simply marked the posts as “sticky,” and made sure each one had a featured image. Sight will display up to 30 of your latest sticky posts this way, giving you lots of flexibility. We’d be remiss if we didn’t also point out how effectively Nova uses her sidebar. There’s not an inch of wasted space here. Nova shares information on herself, her work, her book reviews, her appearances, and more, carving out room in the sidebar to keep all of this important stuff in one place. At the very top of her sidebar, Nova showcases her most recently published book with an image widget that links to her personal website using a photo of the cover. Just underneath this, she cleverly uses a text widget to provide a summary of the book’s plot, along with several quotes from book reviews. A final point about Nova’s sidebar: she’s chosen the order of her widgets with care. This isn’t some hodgepodge mix. She’s got her most vital stuff — her recent book, her appearances, herself — right up top, where you can’t miss them. Nova employs lots of other widgets as you scroll down her sidebar (recent posts, recent comments, Twitter, and a tag cloud, to name a few), but it’s no accident they are where they are. Consider your intended outcomes with your own blog. What’s important to you? What do you want people to see first? As you think about which widgets to use to pull off your vision, don’t forget to spend some time on their order, too. Finally, Nova adds one more layer of customization to her blog with custom fonts and custom colors, as part of the Custom Design upgrade. For just $30 a year, she’s able to pick fonts that are different for each part of her site, but work together overall for a consistent look. And with the custom colors she’s chosen, her entire site is tied together, top to bottom. Hope this helps you, and good luck! Yes…I think this is great. I’ll have to keep this in mind when it’s time for my site’s re-design. Love articles like this. I’m always looking for new ideas and inspiration. Please: more of these kind of posts! Really interesting if you’re not really a pro, but do want to make your blog visually more appealing! Thanks! Sight is a simple, yet complex theme, open to diverse adaptations and the sidebar widgets are really useful. Thanks for the tips in the post and the comments likewise. I look forward to improving and pushing the boundaries of the free version of this theme. I have Sight, too. I love this theme because it looks good for an author/writer type theme, but customization is expensive for me right now. Love to do it sometime in the future. 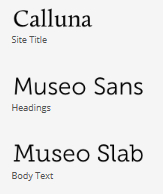 I love CSS style-sheet editing. Thanks for this post. It helped me figure out a couple of things about the themes I use.